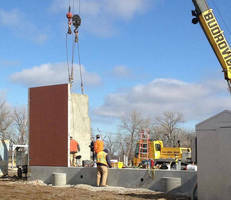 Easi-Set Precast Concrete Buildings offer major water works company a durable solution to fit their renovation needs. Midland, VA — Missouri American Water (MAW), a regional division of the parent American Water Works Company, serves 1.5 million people in more than 150 Missouri communities. With such an expansive reach, maintaining its equipment is essential. At its Central Water Treatment Plant in Maryland Heights, outside of St. Louis, a major replacement was needed for an existing pump station constructed in the 1930s because of hydraulic limitations to operational needs. With a focus on cost savings and a tight schedule, MAW utilized two new Easi-Span precast concrete buildings as part of the renovations at two plants—a 28' x 40' x 13' electrical building for the new pump station at the Central Plant, and a 27' x 38' x 13' switch gear building at the North Plant in Florissant, Mo. The Easi-Span Buildings are the largest clear span all-concrete buildings on the market, and the only expandable concrete building systems. These buildings feature clear-span roofs up to 50 by 250 feet and heights up to 35 feet. Smaller Easi-Set Buildings can be delivered completely erected and pre-outfitted, ready for use once utility hookups are made. The engineering for the Central Plant was led by Carollo Engineers, Kansas City, Mo. and North Plant was led by Ross Baruzzini, St. Louis. The Central plant facility is a 52.5 million gallon per day (MGD) firm capacity high service pump station with a 30-foot-deep wet well. Its operation required four vertical turbine pumps, soft starters, a variable frequency drive, medium voltage switchgear, new automation controls, a 48-inch diameter discharge header and 42-inch transmission main. The pump station was constructed by Goodwin Brothers Construction, Crystal City, Mo., and it selected McCann Concrete Products Inc., Dorsey, Ill., to manufacture the precast building. McCann Concrete is one of 70 licensed producers of Easi-Set Worldwide. The Easi-Span building, which is available with monolithic precast floors, was set on a cast-in-place concrete foundation for this application. The 12 wall panels are 5-inches thick and match existing structures at the site. "We precast the walls with the Easi-Brick system and matched the wall panel to the older brick buildings on site," says Mark Melvin, with McCann Concrete. The client asked for the building to have a 180-mph wind load, which McCann Concrete was able to supply by customizing the structure. For the interior, insulation was added, and the walls have a plywood finish. Any penetrations less than 2 inches in diameter were field-drilled on site, larger ones were cast. The shell of the building was erected in just three days, and the interior finishing took an additional three. While there were no issues with the building construction, the project team did have challenges to overcome as Jennifer Meyer, P.E., senior project engineer with MAW, explained, "The project site is located in the floodplain of the Missouri River. Due to subsurface conditions in the project area, extensive ground improvements were required to protect the new structures, as well as mitigate the construction risk associated with the groundwater table in the project area. Construction limits are surrounded by in-service 24- and 36-inch transmission mains, operating at nearly 200 psi and dating back to 1910, the 1920s and 1930s. Integrating this new pump station with the existing 217 MGD treatment plant and distribution facilities was a complex task." When reviewing materials for water and wastewater applications, Melvin suggests pre-cast concrete simply because buildings can be adapted to meet the specifications of a project—and because it will last. "It is very durable and provides the owner with a long-lasting building. We can customize our solutions, as well. In this case, we were able to design to wind loads of 180 mph, which provides protection for the expensive equipment inside the building." Easi-Set Worldwide, a wholly-owned subsidiary of Smith Midland Corp. (Del. ), a public company, licenses the production and sale of Easi-Set products and provides diversification opportunities to the precast industry worldwide. Easi-Set's prefab buildings are designed to provide durability, convenience and long-lasting security under a variety of applications. These maintenance-free structures are available through licensed precast concrete manufacturers across North America. For more information about Easi-Set precast concrete buildings or licensing opportunities, contact Easi-Set by calling 800-547-4045 or visiting www.EasiSet.com or www.EasiSetBuildings.com.